WooCommerce SEO – Carousel Projects can offer you the absolute best in Search Engine Optimisation (SEO) for your WooCommerce store. If you have worked with SEO companies in the past you will realise just how shallow their depth of knowledge really is. You’ll be offered ‘SEO services’ by an agency who will likely outsource the job to a team in a far-flung country who will then attempt to automate a backlink process which will likely do you more harm than good. The tell-tale sign is them asking you ‘How Many Keywords Are You Looking To Optimise For?‘ – They will then give you a price based on working on just those words – no thought as to site architecture or structure. We work a little differently! From the very moment you speak with us, we have your interest at heart, so just call us for a no obligation chat. We will offer you a full website audit which will give you everything you need to know about the problems with your website. Let’s face it, many Woocommerce stores are set up with little regard to site structure and functionality – it’s generally all about the look. Have you configured all of your pages properly? thought about the site hierarchy? thought about how departments, categories and sub-categories should look – have you thought about how your products should work, the descriptions? In fact, anything and everything which affects how Google ranks your site. Every website has its homepage at the core, yet most people simply call this ‘home page’ and put very little content on it. This is the most important page on your site yet it is often ignored. On there sits the main menu which allows traffic (and Google juice) to flow through your site. Think about how a tower of champagne glasses looks with a single glass at the top – the homepage, two below – gender then moving through departments and categories as the base get bigger. The champagne is Google juice as it reads your site from top to bottom. 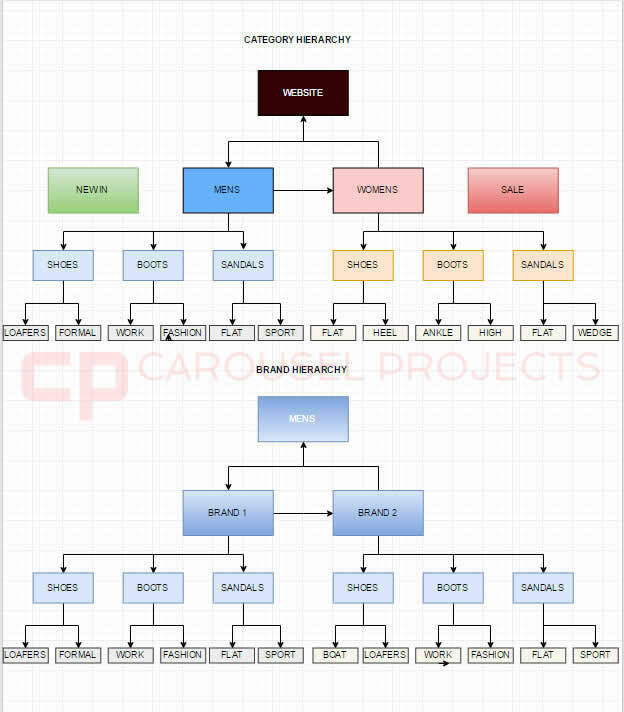 This is just a simple structure which shows what a typical online shoe store might look like. It gets further complicated when you start adding brands into the mix. From the audit, we will then offer you the option of engaging us to fix all of the problems on your website. This can either be done over a short period or more likely spread over a six month period. No two websites are the same. Some are simple sites like the one above – the hierarchy is fairly easy to understand and the fix process is relatively straightforward. However, we have worked with many huge sites where the problems run quite deep. Imagine selling ‘Women’s Winter Boots‘ for example and this is an inline page on your eCommerce website. Perfectly acceptable, the page will have a range of the latest Women’s fur lined and heavy-soled boots for that season along with maybe some descriptive content to help convey the theme of the page. You may then have a junior in the office who is responsible for blog writing. ‘I know I’ll write about our new range of Winter Boots – they’ve just arrived and we can send the post out to our customers’. The bright spark calls the blog post ‘Women’s Winter Boots‘ and adds lots of images from the current collection and writes all about them. Your main Women’s Winter Boots page starts falling and you have no idea why. Well, the bright spark just duplicated the inline money page with a lovely article that just hit you in the guts without you even realising! This kind of cannibalisation is happening in every business up and down the country. The smaller your business is the worse it is affected – you can imagine a company like Next has so many backlinks to all of its pages that the odd blog post would have little effect on its money pages. A small company, however, with few backlinks to help support its inline pages is a different story. We have worked on sites with 500 blog posts and the company can’t understand why it fails to rank for important inline pages. Well, this is part of the answer and the process for correcting this is long and painful. This is only one part of SEO, the terror of duplicate content affecting websites, but there are so many factors these days which can affect how a page is read by Google and indexed. Our pricing is open and transparent. Depending on the size and complexity of the site. An audit will cost from £750 which will give you an actionable document to either work on yourself or engage with us to fix the issues for you. Clearly, this is the best option as we are experts in the field. What we will promise you is that all the work will be done here in the UK, from all of the technical fixes through on-page work and content creation. Our website copywriting service is second to none. We employ UK educated and residing copywriters who immerse themselves in writing SEO rich copy for websites. Once the major theme of the page has been established then copywriting can commence. This involves writing contextually strong content for each page using highly descriptive text using synonyms, similes and predicates to convey the meaning of the page to Google. More importantly, it will feature keyword variations in the text. If your page is about ‘Cycle Tour In France’ then, of course, the page will feature the words ‘cycling’, ‘bike tours’, bicycle written in a natural and engaging way without keyword stuffing! Call us today on 0161 941 2800 or fill in the form on the right!